Have you ever made or eaten chocolate chip bars? They are gooey, and chocolate chip filled with crispy edges. In my opinion the perfect cookie bars have a little bit of crunch with a soft center. You know everybody that makes them eats that dough, just a little bit! Cookie bars are a classic dessert. I decided to take a generic cookie bar recipe and change it up a little. Delicious caramel and cookie filled TWIX Bites, creamy peanut butter and fluffy mini marshmallows all combined with my cookie bar dough for a cookie bar nobody could resist. I found my TWIX unwrapped bites at Walmart in the candy isle as well as the checkout lane (smaller size). 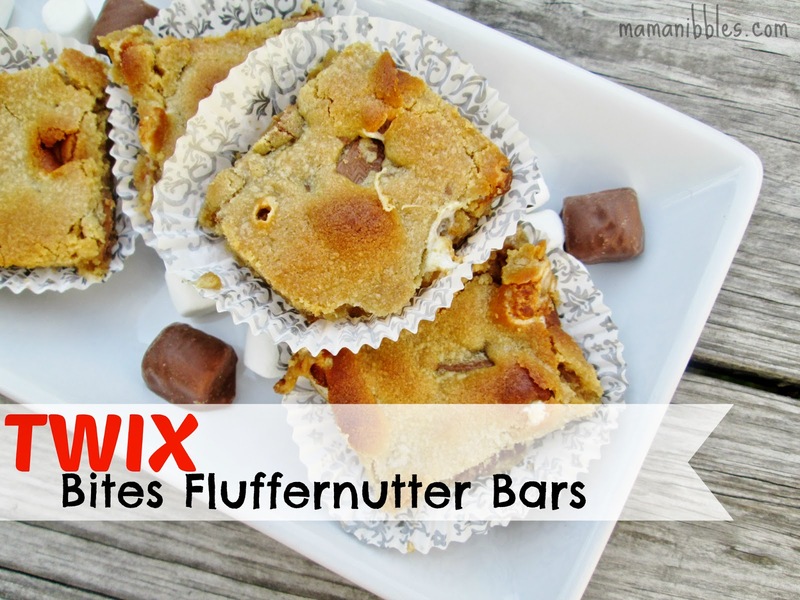 I used a great printable coupon on Social Twist to save some money on my Twix Bites! 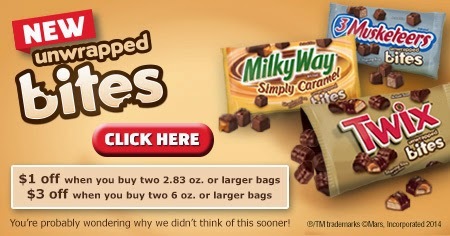 Click the banner below to save $1 when you buy two 2.83 oz or larger bags and $3 off when you buy two 6 oz or larger bags! I remember the first time I had a fluffernutter. I was pregnant with my first and the cravings were all over the place. I was wanting oranges, red grapes, apples, watermelon taffy, and anything chocolate (especially TWIX bars). Sweet treats make for a sweet baby right? Well it certainly made for a sweet mommy-to-be at the time. I should probably also add that (just in case you don't know) a fluffernutter is a peanut butter and marshmallow creme sandwich. Or if one is really desperate just stick a spoon in a jar of pb then roll in marshmallows and sometimes add chocolate chips! It's so stinkin' good. If that sounds appealing to you then you're gonna love this recipe and it's so easy! I cut my bars into squares and wrap each square in parchment or inside of a cupcake paper then set in a sealed container. The best way to store these is in the refrigerator or even longer term in the freezer. It's easy to just defrost one or two bars as needed and even better to heat them up in the microwave a bit. You get the soft cookie bar with crunchy top/edges, the crunchy TWIX Bites cookie with its chocolate and soft caramel, the toasty marshmallows and that delicious peanut butter flavor all in one bite.